In a historic recording career of well over 60 years, Pinetop Perkins was a pivotal building block in the seminal boogie-woogie musical style that subsequently influenced American country, jazz, blues and rock and roll music. Universally acknowledged as one of the greatest blues pianists in history and one of the last great Mississippi Delta blues legends currently performing, the Grammy Lifetime Achievement and Blues Hall of Fame honoree famed for his version of “Pinetop’s Boogie Woogie” played vigorously even as his lifetime nears a century. Perkins’ adept fingers pranced and rolled on the keyboard, chronicling his unique strolling Chicago blues-influenced boogie-woogie style that was later blueprinted by Fats Waller, Fats Domino, Ike Turner, Champion Jack Dupree, and Huey “Piano” Smith. Accompanying Perkins at the cozy restaurant-live music bar was lifelong friend and collaborator Willie “Big Eyes” Smith, a blues veteran with deft drumming and hair-raising harmonica skills. Both Perkins and Smith were central figures in Muddy Waters’ backing band and formed the Grammy-nominated Legendary Blues Band in 1980 whose accomplishments included working with the Rolling Stones, Bob Dylan, Buddy Guy, Howlin’ Wolf, and Eric Clapton. The two men, with the enlistment of highly skilled backing band and the sponsorship of the San Antonio Blues Society, were the main attractions of the night. Willie Smith was a blaze of blues thunder bursting with charismatic energy as his joviality and macho swagger drew attention. Renditions of Jimmy Reed’s perennial “Bright Lights, Big City” and Little Walter’s evergreens “You’re So Fine” and “Tell Me Mama” were punctuated by Smith’s incredible howling harmonica solos and manly grinds, sweaty palpitations, and playful dancing that was a cross between Junior Wells and James Brown. “I’m gonna get me some tequila and really wake me up,” he relayed to the audience, but truth is all he needed was a natural catalyst in the form of boiling blues. Pinetop Perkins equaled time served in the limelight with dress in classic Chicago blues fashion style, supported by Smith and the backing drum-bass-lead guitar combo. “They call me Pinetop Perkins,” he declared, fingers mechanically on the keyboard. He then let out a swinging blues rhythm called “Down In Mississippi” and an anthem-driven reading of Peetie Wheatstraw’s “Working Man (Doing the Best I Can).” Perkins delegated what tunes would be played and never lost command of his keyboard triplets, slides, and emphatic pounding that put him in the same constellation of piano greats such as Pinetop Smith, Jimmy Yancey, Meade Lux Lewis, and Albert Ammons. Crowd sing-a-longs, such as their version of the iconic Muddy Waters staple “Got My Mojo Working” and “Cut That Out,” had the audience in unison as the musicians’ watertight and frenetic musicianship embraced exceptional synchronization. “Cut That Out” is found on Perkins’ and Smith’s current release Joined At the Hip, a 2011 Grammy nominee for Best Traditional Blues Album. With high-octane harmonica outbursts and kinetic keyboard filigrees Pinetop Perkins and Willie “Big Eyes” Smith evinced the topmost boundless energy and potency of boogie-woogie and harmonica blues that remain hallmarks of American music. 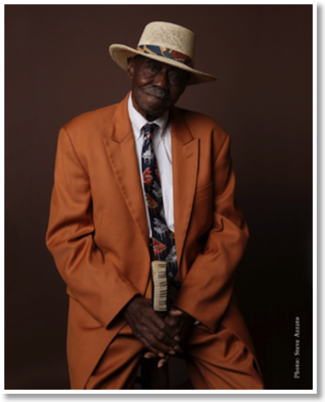 Editor’s note: It is with great sadness that we inform our readers that Grammy-winner Pinetop Perkins has passed away at his home in Austin, Texas, on March 21, 2011. This concert performance was one of his last and we were fortunate to be able to cover his artful music.